Over the past few years, astronomers have observed a new phenomenon, a brief burst of radio waves, lasting only a few milliseconds. It was first seen by chance in 2007, when astronomers went through archival data from the Parkes Radio Telescope in Eastern Australia. Since then we have seen six more such bursts in the Parkes telescope’s data and a seventh burst was found in the data from the Arecibo telescope in Puerto Rico. They were almost all discovered long after they had occurred, but then astronomers began to look specifically for them right as they happen. 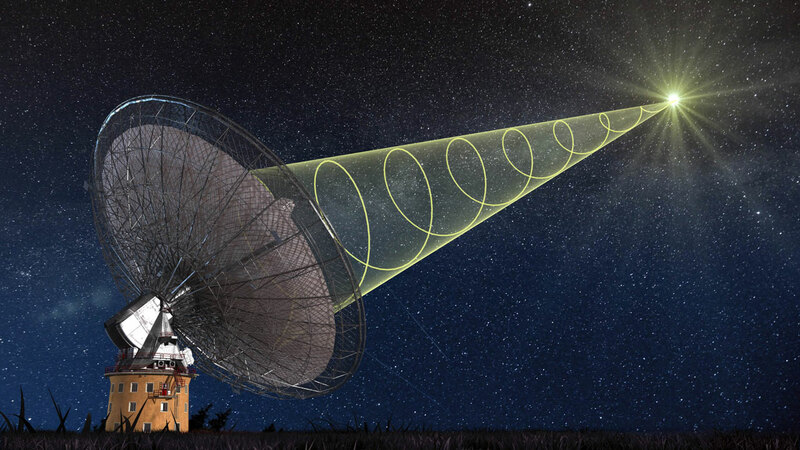 A team of astronomers in Australia developed a technique to search for these ‘Fast Radio Bursts’, so they could look for the bursts in real time. The technique worked and now a group of astronomers, led by Emily Petroff (Swinburne University of Technology), have succeeded in observing the first ‘live’ burst with the Parkes telescope. 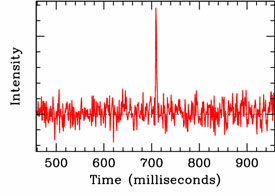 The characteristics of the event indicated that the source of the burst was up to 5.5 billion light years from Earth. The electromagnetic spectrum. There are many more colors that our eyes can see: electromagnetic radiation is defined by its wavelength. 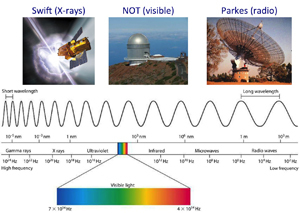 Visible light is only a small part of the existing spectrum. 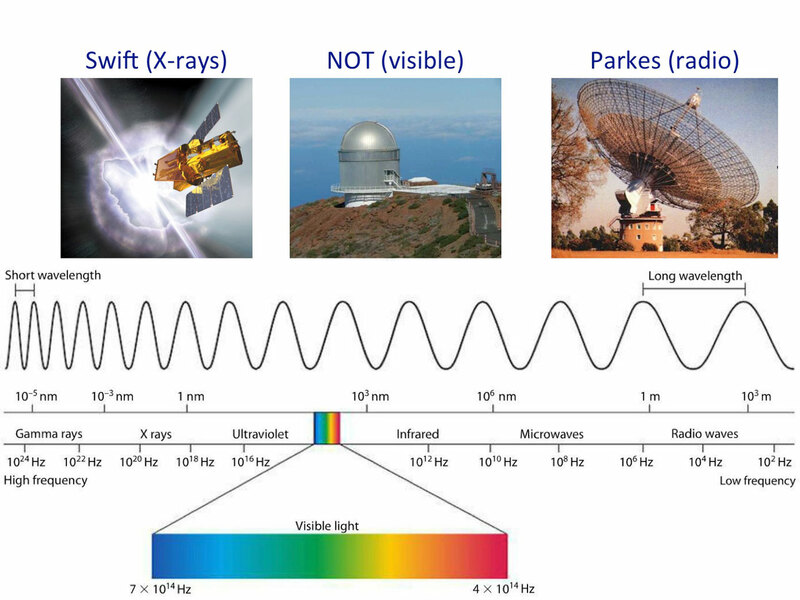 For the study of fast radio bursts, scientists looked for radio waves with the Parkes telescope, then X-rays with the Swift satellite, and then optical light with the Nordic Optical Telescope, among others. Now that they had the burst location and as soon as it was observed, a number of other telescopes around the world were alerted – on both ground and in space, in order to make follow-up observations on other wavelengths. “Using the Swift space telescope we can observe light in the X-ray region and we saw two X-ray sources at that position,” explains Daniele Malesani, astrophysicist at the Dark Cosmology Centre, Niels Bohr Institute, University of Copenhagen. 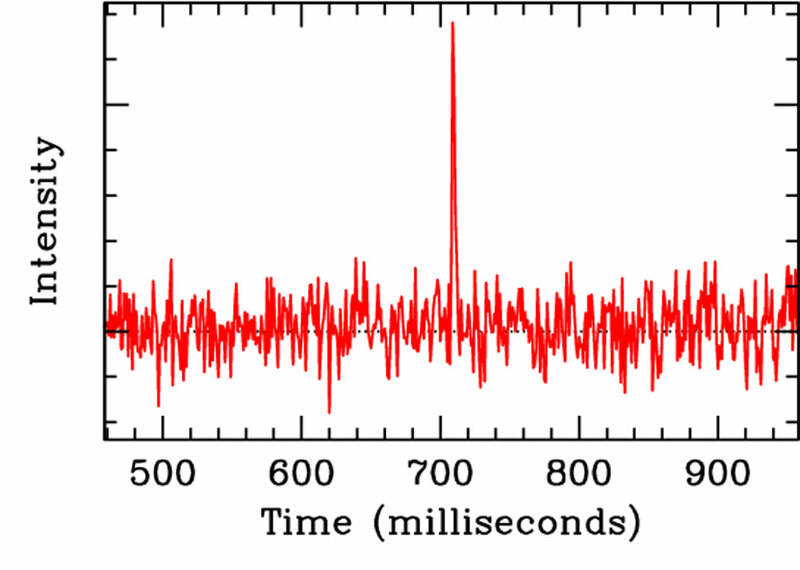 Then the two X-ray sources were observed using the Nordic Optical Telescope on La Palma. “We observed in visible light and we could see that there were two quasars, that is to say, active black holes. 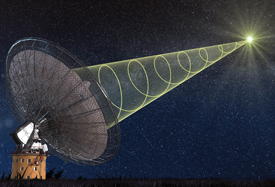 They had nothing to do with the radio wave bursts, but just happen to be located in the same direction,” explains astrophysicist Giorgos Leloudas, Dark Cosmology Centre, Niels Bohr Institute, University of Copenhagen and Weizmann Institute, Israel.